The Georgia collection offers a contemporary twist to comfort and style with this plush upholstered range. 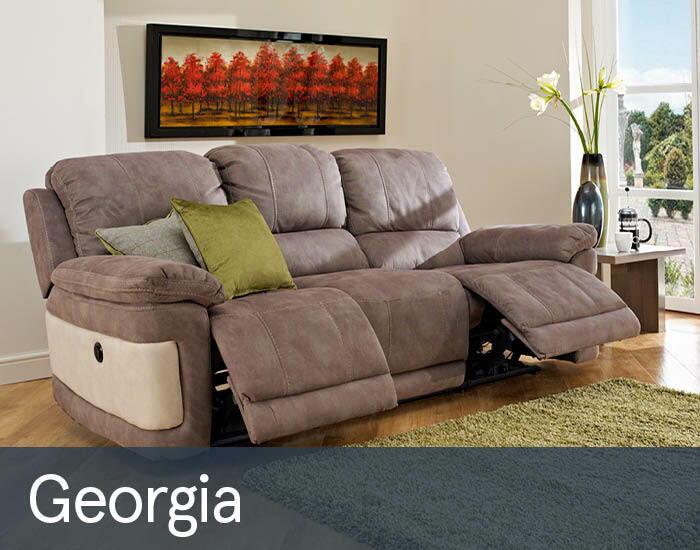 Upholstered in soft leather for a comfortable touch, with foam seats and fibre filled backs, the Georgia range presents a plush range of seating ideal for those with the utmost comfort in mind. Available with full chaise recliner leg for support and dual cushioned back to provide excellent lumbar support, each sofa gives relaxation without leaving you with aches and pains. Offered in a choice of two tone fabrics to suit darker or lighter decor, with contrasting stitching and side panels. Within this range is the recliner chair, 2 seater double recliners and 3 seater double recliners, each with a power or manual option.